Based on the number of Google search requests for the Apple iPhone, Swiss brokerage firm UBS' Evidence Lab Phone Monitor is raising its estimate of first quarter iPhone sales to 70.9 million units. That far surpasses the brokerage firm consensus of 64 million units that are expected to be sold for the three month period running from the beginning of January, to the end of March. UBS analyst Steve Milunovich was impressed enough by the report to raise his first quarter iPhone sales forecast by 4 million phones, to 67 million. Still, the highly-regarded analyst is worried that Apple won't have enough phones on hand in order to hit the higher estimate produced by the Evidence Lab Phone Monitor. For the seasonally weaker second quarter, Milunovich sees Apple cutting production of the Apple iPhone 6 by 40% sequentially from the first quarter. The analyst says that for the April through June quarter, Apple will change the mix and build a higher percentage of Apple iPhone 6 Plus units. This will help satiate strong demand for the phablet in Asia, and make up for supply issues with the device that he expects to see in the first quarter. No one see that coming. Actually we did. Due to the bigger screen, Apple gained a lot more costumers that had previously wanted a big screen phone but Android wasn't their cup of tea. Coupled with the fact that they made iOS 8 a lot more open than it used to be. Your sarcasm detector needs an oil change. This is going to be interesting next year: what will the iPhone 6s/Plus S (?) demand be like? I find it hard to imagine that it could be anything like the madness we are seeing now...though Apple has been known to perform sales miracles. Oh boy! Not this comment again. I could retire if I had a dollar every time I've read something like this over the years with iphone sales. Dude, there are millions of people that are not upgrade eligible this year. Then you add all the people who are not on contract that upgrade every year. Add all the people that are switching from other platforms and lastly, add all the people who are rocking mad old iPhones who are finally ready to upgrade. Unlike computers, TVs and tablets, people usually upgrade their phones pretty often. It's probably the most necessary gadget out their. Nctx77 is right. Every generation of the iPhone has sold more than the previous. That's 7 times in a row now. There is no reason to think it won't happen again. I agree that it would be foolish to think that the trend will continue forever, but there is no indication that it won't continue to happen for some time to come. Even if the 6S has no killer features, that doesn't change much. It wouldn't be the first time that an S iteration launched without any & still exceeded is predecessor. Good argument, and very true, minimal updates to hardware haven't hindered sales in the past, but I'm sticking by my initial statement. But I welcome the idea of Apple surprising me with something unexpected. maybe they'll actually have sapphire displays with near zero reflections making the outdoor visibility unparalleled. That would be a strong selling point I would think. bitter fandroids, go! bash the iPhone buyers, or those you call iSheeps. LOL! unleash your immaturity & narrow-mindedness. Yet on most sites and articles fanboys always mention "isheep" before any of them comment, they are worse than the isheep. Impossibly incredible sales numbers. And they totally deserve this success, these are the best smartphones I have EVER used. 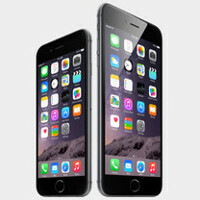 Apple is simply the best...., And the IPhones are simply the best phones in the market. This huge success proves one thing, no one cares about Android, people don't like it. The only reason android phones had some success is 1, the price and 2, screen size, the reason of their succes was the hardware not the software. And yet when people attack the iPhone, it's usually criticizing the operating system. You hear things along the lines of glorified app launcher, incapable of true multitasking, restrictive. Yes, your OS has optimization on its side, but each year that becomes less and less the case which is apparent when phones from the previous year suffers performance issues with the updated OS. It's not the same with Android as it has a significant amount of customization, features iOS won't get for years if ever, and Android devices typically improve their performance with OS updates. Take this into account with the points you made, we're not getting robbed by our OEMs when compared to the prices you pay, and then of course the hardware, we have so many options for consumers to choose from, people can buy a phone that best fits them. Plus the Apple ecosystem is anything to be desired, iCloud getting hacked, music getting deleted, accounts getting hijacked. "This huge success proves one thing, no one cares about Android, people don't like it. ", right... everything I listed above is why 85% of the global market skips Apple's iOS and uses Android as their mobile OS of choice. Say what? The Android OS is still hanging on to a massive 85% of the global market. 70,900,000 units is only impressive until you compare it to what Google is doing with their OS. Don't waste your time with this guy, Scott. He is proving himself to be of the biggest trolls on the site. Truth isn't trolling. Apple being the best is a fact you should accept and live with it. And what you do isn't truth. Now that you mention it, I'm not sure what I was thinking.